No one looks forward to needing to hire a plumber. Unfortunately, just about every homeowner will need help from one from time to time. 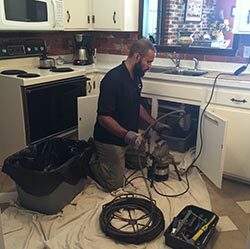 Whether you need a hand with emergency plumbing repair, you are having a new fixture or appliance installed or you just need some help with a minor clog or standard maintenance, choosing the right company makes all the difference. When you need to hire a plumber, here are a few key things to look for. Not all plumbers have the right insurance and credentials. Look for one who is licensed to perform work in your area and has the proper bonding and insurance. If you don’t, you may be stuck holding the bill if there are any problems with the work performed. Few things are worse than a service provider who fails to show up when promised, especially when you are facing an emergency situation. Look for a plumber who has a strong reputation for showing up when scheduled. When you hire a plumber, you are welcoming a stranger into your home. Unfortunately, not all companies are created equally, and some are not as professional as others. Look for a company with well-groomed technicians who are required to submit to drug testing and background checks. If a company doesn’t seem professional, look for another. Looking for a plumber that offers fair pricing does not mean opting for the cheapest price you can find. Instead, look for the one who offers the best value for your money. To avoid unpleasant surprises, only hire plumbers who offer honest, upfront pricing. Find a plumber who uses high-quality materials and performs excellent services that will last. You may pay a little bit more in the beginning, but the best plumbing companies offer fair pricing on products and services that are meant to last for several years. When you need to hire a plumber in Rochester, look no further than G.T. Campbell Plumbing. We offer a full range of professional plumbing services you can count on, and thanks to our upfront pricing policy, you’ll never have to worry when the time comes to pay the bill. If you are looking for a plumber in Rochester or the surrounding areas, contact G.T. Campbell Plumbing today by calling 585-412-4008.